The paper outlines how a cellular mechanism called splicing is different in cancer cells than in normal cells. The mechanism occurs as the cell translates the genetic code into the proteins it needs to function. In normal cells, splicing acts like a switch to turn on certain protein production, but this does not work properly in cancer cells. Younis and El Marabti believe that targeting cells with the faulty splicing mechanism could be one way to kill cancer cells while leaving healthy cells intact. When he joined the CMU-Q faculty in 2015, Younis turned to his students to help him establish a research lab; El Marabti, who was then a third-year student, was given the task of analyzing the sequence of the genetic codes of normal and cancerous cells. “I learned that I love research because of this project with Dr. Younis,” said El Marabti. The project continued and grew, and in 2017, El Marabti presented his findings at the Keystone Symposium on mRNA Processing and Human Disease in New Mexico, USA, as well as CMU-Q’s research symposium, Meeting of the Minds. El Marabti took the top prize at Meeting of the Minds 2017. After his graduation from CMU-Q in 2017, El Marabti began medical school at Weill Cornell Medicine-Qatar. The paper in Frontiers in Molecular Bioscienceswas completed while El Marabti was a first-year medical student. 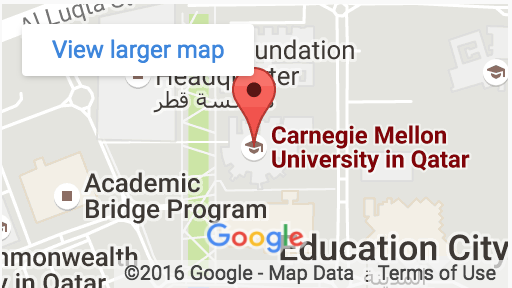 Carnegie Mellon University in Qatar offers undergraduate degree programs in biological sciences, business administration, computational biology, computer science and information systems. Students are encouraged to participate in research to hone their skills in creative problem solving and scientific inquiry.